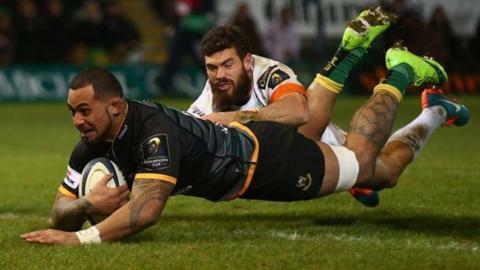 Northampton ran in 11 tries against Treviso for a club record European win to stay on course to qualify for the European Champions Cup last eight. An early penalty try, plus scores from wing George North, scrum-half Kahn Fotuali'i and wing Ken Pisi plus two Stephen Myler conversions gave the Saints a 24-0 lead at half-time. Further tries came from George Pisi, Ben Foden plus two more by Ken Pisi. Substitute Samu Manoa added a hat-trick as Saints stayed top of pool five. The convincing victory at Franklin's Gardens bettered the 68-21 success against another Italian side - Overmach Parma - during the 2006-2007 season. The European champions are on 15 points with victories away to Ospreys and at home to Racing Metro enough to guarantee a place in the last eight. After just 12 minutes, Northampton's scrummaging power led to a penalty try that Myler converted. North ran in his fifth try of the current European campaign, before Fotuali'i turned Treviso full-back Jayden Hayward inside out to push Saints clear. Flanker Calum Clark off-loaded to Ken Pisi, who sprinted over to clinch the bonus point, six minutes before half-time. George Pisi crossed four minutes after the restart before James Wilson's angled run created the opportunity for Ken Pisi to get his second try. Manoa scored two tries in four minutes, after he replaced Clark, and then completed his hat-trick at the base of an advancing Northampton scrum. Ken Pisi got his hat-trick, too, before Foden, who was on for North, added the final try. "We hoped for but didn't expect that win. We had to work hard for our bonus point last week, but it always helps coming back home. "It was important that we made a good start and kept it clinical and professional. Once we got ahead, their heads certainly dropped. "We saw some brilliant handling today and outstanding tries. I think (attack coach) Alex King will be very happy tonight." Northampton: James Wilson; Ken Pisi, George Pisi, Tom Stephenson, George North; Steve Myler, Kahn Fotuali'i; Ethan Waller, Dylan Hartley (capt), Salesi Ma'afu, Sam Dickinson, Courtney Lawes, Calum Clark, Tom Wood, Phil Dowson. Replacements: Foden for North (46), Manoa for Myler (52), A. Waller for E. Waller (67), Haywood for Hartley (52), Denman for Ma'afu (52), C. Day for Lawes (59). Not Used: L Dickson, Burrell. Treviso: Jayden Hayward; Simone Ragusi, Luca Morisi, Enrico Bacchin, Ludovico Nitoglia; Joe Carlisle, Edoardo Gori; Matteo Zanusso, Albert Alfred Anae, Matteo Muccignat, Antonio Pavanello (capt), Fuser, Meyer Swanepoel, Francesco Minto, Mathew Henry Luamanu. Replacements: Ambrosini for Morisi (60), Trevisan for Bacchin (49), Favaro for Gori (80), Kudin for Anae (50), Garfagnoli for Muccignat (55), Lazzaroni for Swanepoel (65). Not Used: Acosta, Vallejos.